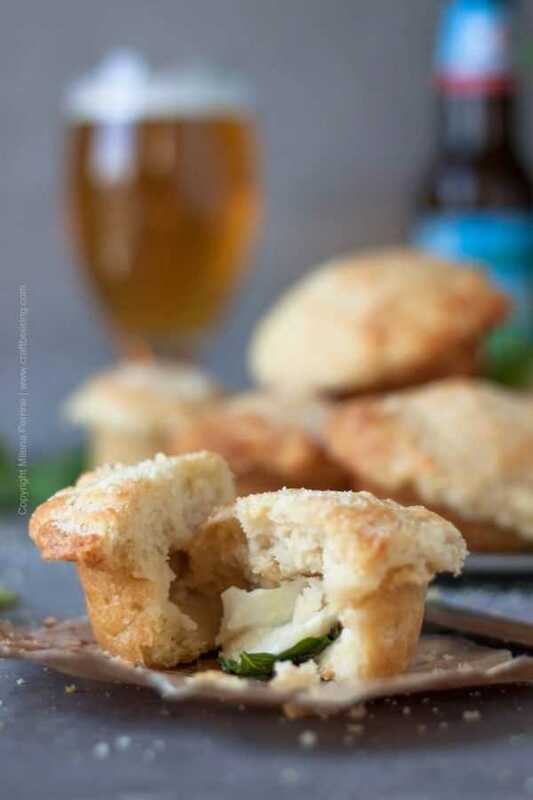 Extra buttery beer muffins stuffed with fresh mozzarella and basil on the menu today! Airy, moist and crusty all at the same time. 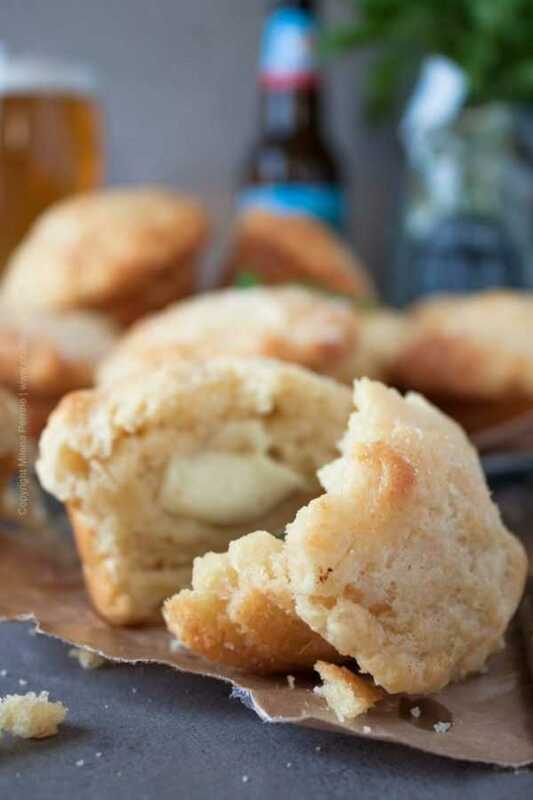 They start with a dreamy batter featuring melted butter, grated Parmesan and sweet, malty lager or ale. The texture, aromas and flavors act in concert to deliver an experience you will want to repeat. And since they are so easy to make you may as well do exactly that. So excited to share these with you! But… I have to open with this – in order to fully enjoy the Perrine family’s beer muffins, you must not fear butter. Bonus points if you really like butter. The beer works to create the airy texture, the Parmesan lends them earthy saltines, but it is the butter that makes them ultra moist. A perfect illustration that cooking with beer is not just about the beer. So if you are good with loads and loads of butter – let’s go. We actually believe that butter is not only millions of times tastier than cooking oil but also better for you:) Let’s not delve into what canola oil and vegetable oil are made from…Someone else can tackle GMO rapeseed and soy beans a lot more successfully than us. Is the Batter the same as in Beer Bread? Almost, but not quite. There is no sugar in this batter. Instead our recipe calls for grated Parmesan which brings a depth of flavor. There is a lot of butter (I warned you) – some of it folded into the batter, some of it absorbed by the muffins as they begin to bake and the rest of it brushed onto them after they are baked. The results are closer to biscuits, the kind you get at Red Lobster that spoil your whole dinner and cause you to leave with ‘to go’ boxes. Due to the preparation method however (the butter is to blame) you need the convenience of a muffin tin. Hence, they look like muffins after they rise and we call them beer muffins. You are in luck. Nothing complicated to note. For as long as you can stir your beer muffins will turn out great. Watch me prepare a batch in the video below. 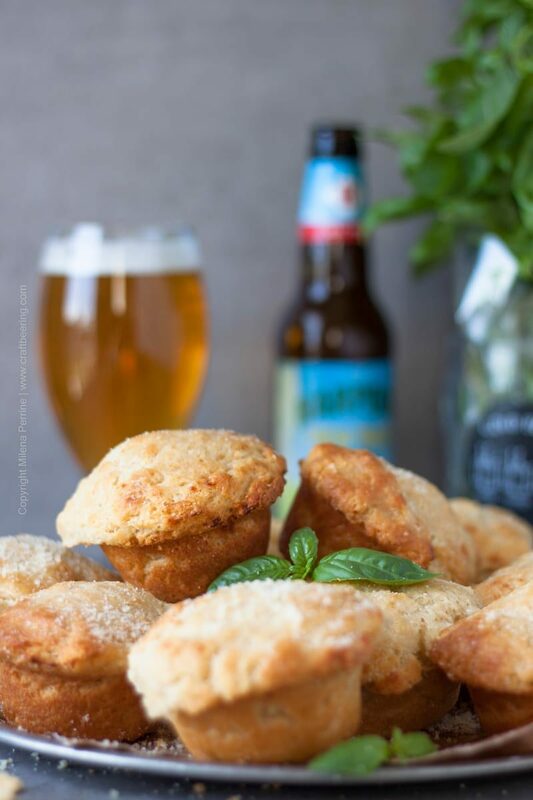 Beer muffins that no one can resist. Wonderful airy texture, yet moist and crusty. Stuff with mozzarella or your choice of cheese. Or olives, or ham. You get the idea. Best eaten warm, (almost) right out of the oven. Place sifted flour into a mixing bowl, add the baking powder, baking soda and salt and mix very well. Add the grated Parmesan cheese and stir to incorporate into the flour mixture. Add the stick of melted butter, stir. Add the beer and stir until it is absorbed and you have a thick, sticky mixture, remotely resembling batter and much more similar to dough. Using two soup spoons fill each cup with mixture (you should use half of the quantity you mixed). Wrap the mozzarella balls/pieces in basil leaves and place in the center of each cup. Using the soup spoons add more batter in each cup, covering the mozzarella and using up the rest of the mixture. Gently press the batter around the rim of each muffin cup to seal the mozzarella and basil and prevent the cheese from oozing out as it melts. Add the 12 pieces of butter, one on top of each batter filled muffin cup. Bake for 20-22 min, depending on your oven. When golden brown and a toothpick comes out clean, remove from oven. While the muffins are cooling off, brush with the 1/2 stick melted butter. When they have cooled off enough to touch, serve and enjoy immediately. I used a Munich Helles lager – a sweeter version of German pilsner, home brewed by Chris. We finally have a sweet set up for fermenting lagers at correct auto-controlled temperatures and he made us a Helles. It is after all my favorite light lager and for him it may be tied with Dunkel at this point. That’s what happens when you have an excellent small craft brewery specializing in German styles in your (almost) backyard. Zwei Brewing near us make an amazing Helles. 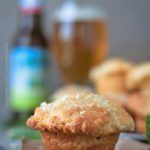 If you fall for these buttery beer muffins (and we are quite confident that you will) you can tweak our base recipe in a variety of ways to build up on your own taste preferences and get creative with them. OMG, mozzarella, basil, and beer batter? Sign me up! I seem to keep clicking on your recipes (found this one on Saturday Sharefest; congrats on being featured! ), so I just went ahead and followed you on Pinterest too! As they say in Germany, “Prost!”. I’m not a huge fan of muffins except carrot and savory ones. Loaded with cheese and basil, these guys sound absolutely delicious to me. I’d add some pesto or pine nuts too. Sure thing, Ben, sounds like a great idea. These Muffins will be outstanding! Hope you are having a great day and thanks so much for sharing with us at Full Plate Thursday. I have to confess I started eating butter here, in Canada, with Loreto. Before, not really. My mother has always blamed butter for being all kind of evil and we never had it in our house. And although e.v.o. oil is a good substitute, there are some things that are just better with butter. 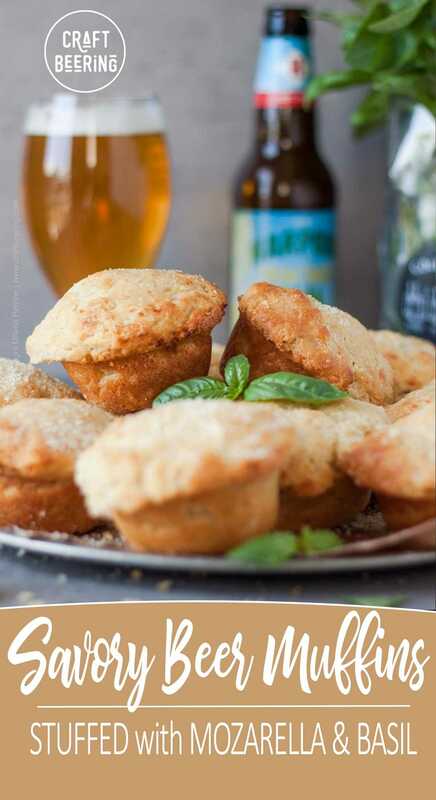 Like these beer muffins, for example, which if I had right in front of me now, I’d eat two without taking a breathing 🙂 . Your video is awesome and makes you want to start baking a batch! P.s. I do use butter quite a lot, now 😉 . I’ve legit died and gone to beer muffin heaven (that’s a place, right? Lie to me). I didn’t comment on your lamb post bc I don’t care for lamb but Mozzarella Basil Stuffed BEER MUFFINS? PIN PIN PIN!!! I’m getting all pinny with it over hurr. Yeah, and bring on the butter, no fear here! I’m making dinner with 2 groups of friends this weekend. I think I have time to make these bad boys tomorrow and surprise everybody!!! Ok, I’m just gonna come out and say it – you must really like me cause my middle name is butter, lol. And love how you just ‘moist’ here 😉 Plus, cheese. I love cheese. You probably know that. And cheese and basil is classic. I think I need one of these right now. I can only imagine how delicious these are fresh out of the oven smothered in butter. Now, I’m hungry. Pinned! We really love this about you, Dawn! A kindred, beer and butter loving spirit! You had me at mozzarella & basil! Does that surprise you? I didn’t think so! 😉 WOW! This is one exciting muffin! Not surprised at all, Annie:) You know a thing or two about Italian ingredients! Butter and I are soul mates. I could no more fear copious amounts of butter slathered on a warm muffin than I could fear oxygen :). These muffins sound delicious! I love anything that’s recommended to be eaten with plenty of butter! Knew we could count on you:) Butter, dreamy butter:) Thank you, Kelsie! 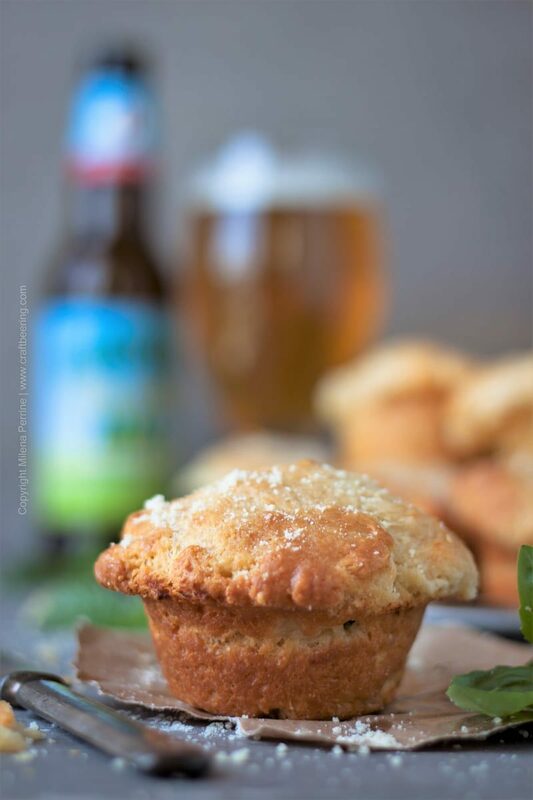 You know I don’t fear the butter 😉 Love these cheese stuffed, beer muffins! That’s one reason why we love your cooking so much:) Thank you, Jennifer!